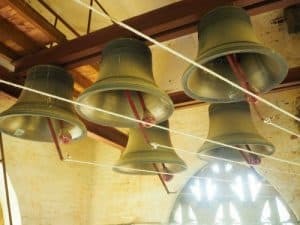 The Church of St Andrew has a peal of eight bells which are played before our church services to call people to worship and after most weddings as part of the celebration. 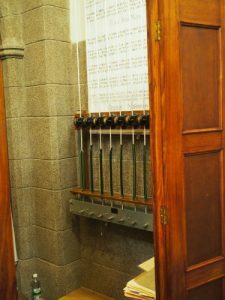 The peal of bells was donated to St Andrew’s in 1968 by Roy Rowe who donated the bells in honour of motherhood and in memory of his own mother. The bells were cast at the Bell Foundry of John Taylor & Co in Loughborough, England. 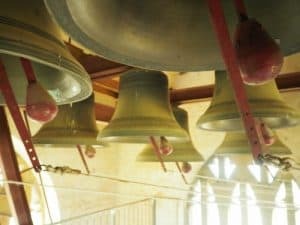 This foundry also cast the bells of St John’s, Reid and the Carillon in the ACT. 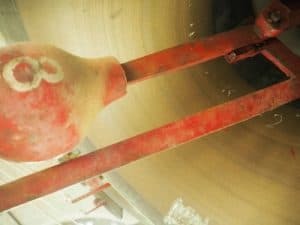 The bells vary in size from the smallest bell of 20” in diameter and weighing 89kg to the largest bell of 38” in diameter and weighing 535kg. 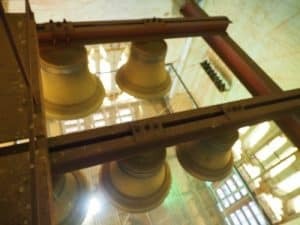 The bells are mounted under steel beams in the tower and do not swing. 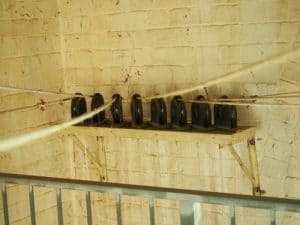 The bells are rung by ropes which cause the bell clapper to strike the inside of the bell. 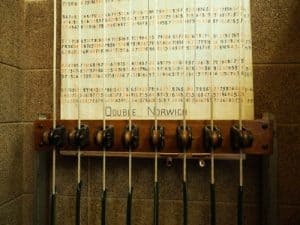 The bells are rung by two people each ringing four bells. Each year for the 10 evenings before Christmas everyone is invited to visit St Andrew’s to view our nativity scene, see our Christmas lights and to ring our bells.